Back in May, Amazon and Twitter introduced the hashtag #AmazonCart, allowing users to add items to their Amazon shopping cart via Twitter. 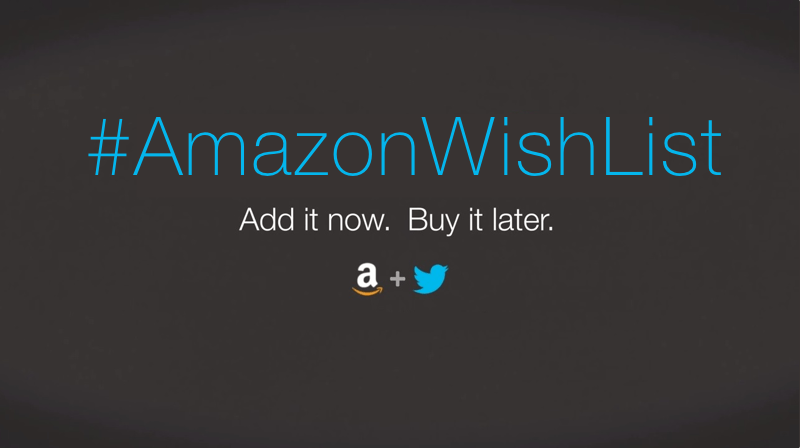 Now, both companies have come together once again to introduce the #AmazonWishList hashtag, which as the name suggests, allows people to add items to their wish lists with a single tweet. As with the former, you need to connect your Amazon account to your Twitter account to take advantage of the new hashtag. Once done, you can either send a tweet containing the #AmazonWishList hashtag and a link to an Amazon product, or reply with the hashtag to a tweet containing an Amazon product link, to add the item to your wish list. You'll then receive an email, as well as a reply tweet from the company's @MyAmazon account when the item is successfully added to your wish list. Amazon Wish List is one of the online retailer's most popular features, especially during the holiday season. Last year, one in three Amazon customers added items to their wish lists, accounting for 50 items added to wish lists every second, the company says. Besides the new hashtag, the company also rolled out a new Save-A-Photo feature that allows you to upload pictures and save them to your wish list. Twitter itself has also been experimenting with e-commerce. Earlier this month, the microblogging website officially announced that it is testing a "buy" button that allows a mobile user to buy directly from a tweet.